During the holidays, there’s nothing better than a decadent breakfast at home to start the day. Indulge yourself by having dessert for breakfast! I was dazzled the first time I saw bananas foster made tableside in a restaurant and served flambéed. You can do this at home, even without the theatrics. 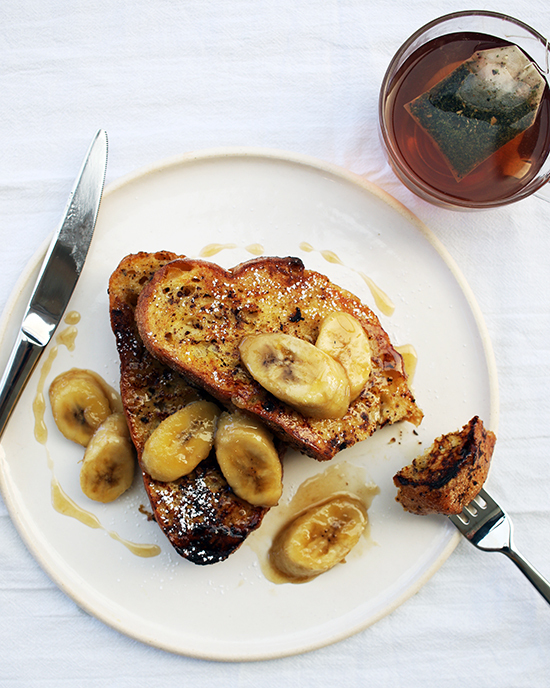 The bananas are simply sautéed with butter, brown sugar, and a splash of rum. No it’s not too early to have a spike of rum, most of it gets cooked off in the process (and you deserve it after spending a few days with your family). For this recipe, I’m using hearty slices of artisanal La Brea Bakery Pane Toscano Bread. The combination of semolina flour and slightly higher levels of sourdough on this loaf give it a traditional, hearty flavor. The bread’s crusty edges and soft center are perfect for dunking into the cinnamon egg custard. Fry these up in a pan until the bread is golden and crusty, and finish by ladling with warm banana caramel sauce. This is the perfect breakfast for a leisurely stay-in-your-pajamas morning. We recently shared our ultimate creme brulee french toast recipe with Eyeswoon, perfect for Christmas morning. There's nothing better than waking up to the aroma of caramelized sugar and vanilla wafting throughout your home...you'll never want breakfast to end.